What is a dually truck? A dually or dual wheel truck has a longer axle and two rear tires. Dually mud flaps are both wider and longer than average mud flaps! Dual wheel trucks kick up twice the rocks and mud onto vehicles you are towing or driving in front of. Mudflaps.com offers the best selection of dually mud flaps and splash guards online for most vehicles. We offer the leading manufacturers offering mud flaps with both smooth stainless steel and diamond tread accent plates. Mudflaps.com advises extra caution when backing up your dually truck when mud flaps or splash guards are mounted. To get you started check out the following manufacturers: Go Industries, Owens and Luverne. Dually mud flaps by Owens come with (2) flaps, mounting hardware and all the necessary brackets for installation. Owens offers both stainless steel and diamond tread accent plates. 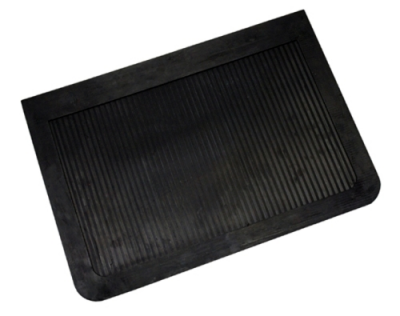 Owens Mud Flaps are heavy duty, durable rubber and will last for the lifetime of your truck. We carry a full selection of flaps for Ford, Chevy, Dodge and GMC trucks. Go Industries 725F Universal Dually Mud Flaps 19" x 24"
Dually mud flaps are a great way to add protection to your truck. Especially if you tow a trailer, fifth wheel or boat. Order today or call 1-720-242-7322 for more information. How do these mud flaps attach? Owens and Go Industries mud flaps attach to your truck using a bracket kit. Each mud flap set includes brackets. Molded models like Husky and Luverne attach using mounting hardware and existing holes. Additional drill may be required. 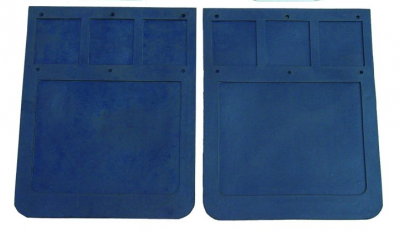 If you need help finding a set of flaps please call us at 1-720-242-7322 and ask us!